Our broiler chickens and turkeys are raised in movable pasture pens. These are bottomless pens that give the birds protection from direct sun, rain, and predators, while allowing them to eat bugs and grasses. We move the pens to fresh pasture on a daily basis to give the birds continuous foraging and to ensure even manure distribution, which revitalizes the grass for the cows. We raise Cornish Cross chickens and Broad-Breasted White turkeys. They are fed certified non-GMO grain that is grown without pesticides, herbicides, or synthetic fertilizers. Our laying hens live out on pasture and are sheltered in a movable chicken house, which regularly moves to different locations throughout the farm. This benefits the hens by allowing continuous foraging of bugs and grasses, and the pasture by providing even manure distribution. We feed our hens certified non-GMO grain that is grown without pesticides, herbicides, or synthetic fertilizers. They also get treated to veggies and milk from our farm. 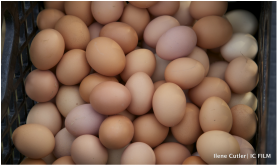 Eggs: Eggs are $6.50/dozen and can be purchased year-round at our farm store. We will gladly take back your used clean egg cartons – you can just leave them in the farm store any time. Broiler Chicken: Whole chickens, organs, and parts are for sale in our farm store (see price list below). You can also access our chicken through our meat subscription. Turkey: We sell fresh turkeys for Thanksgiving. We will start taking orders for Thanksgiving 2019 in the fall.